It’s only been 3 weeks since National Grilled Cheese month, and my quest to have a different grilled cheese every weekday, ended. By my count, I made at least 30 grilled cheese sandwiches last month, 23 of which were different. You might think I’d be tired of grilled cheese at this point, and that I’d avoid a restaurant that serves some of the most massive, insane grilled cheese sandwiches in the state. Enter the Melt Bar and Grilled, located about 15 minutes west of downtown Cleveland. Last Saturday, as I watched our location move closer and closer to our destination on the GPS, my dreams of traveling to the grilled cheese mecca became more of a delicious reality with each passing mile. We arrived in the middle of lunch rush, and the restaurant was pretty busy. We were told there would be about a 45 minute wait for a table. OK. David followed the official Melt procedure and fished a name tag for our party out of the big orange jack-o-lantern by the register (he ended up with “Kimm Chee”) and we resigned ourselves to wait for our ticket to grilled-cheese paradise. 45 seconds later, we had a table. Our theory is that the 45 minute wait is a test. If you are not willing to wait 45 minutes for one of the best sandwiches you may ever have, you are unworthy. When you come to Melt, you’ve got to want it. You’ve got to bring it. David ordered the Prime Time Rib Melt, with prime rib, cheesy garlic mashed potatoes, provolone, horseradish sauce and au jus. I chose the “Big Popper”, full of fresh jalapeño peppers, as well as cheddar and herbed cream cheese. The sandwich is beer battered, deep fried, sprinkled with powdered sugar and served with a sauce of mixed berry preserves. 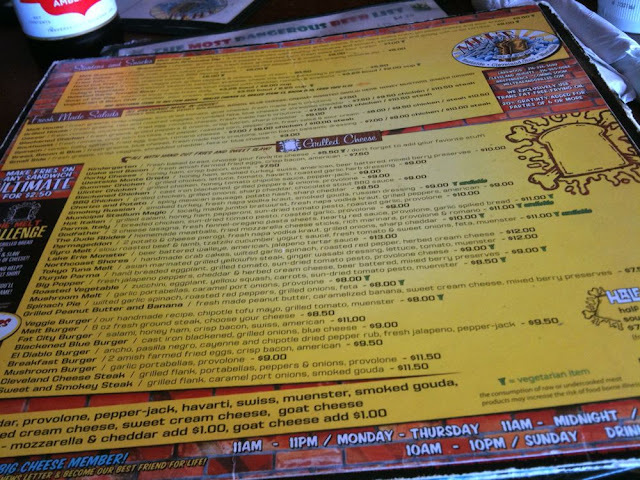 I also asked for a side of the honey chipotle tomato dip with the house-cut fries that come with every sandwich. We ordered two pints and a pierogi to tide us over while we waited for our orders, which was very good and a nice size to split. David watched Kung Fu on the television behind me while I admired the décor. Our sandwiches arrived fairly quickly, and they were incredible. If I lived in Cleveland, I’d be at Melt all.the.time. And probably 3 pants sizes bigger. I’m pretty sure it would be worth it. The staff was extremely nice and friendly, and—this goes back to my previous post about the people in Cleveland—our server was full of suggestions on where we should stop by before we left. Last week, David and I voyaged North. Our destinations? Columbus, and later, Cleveland. We took plenty of pictures, watched a lot of discovery channel on the hotel TV (which seems to have turned into the “extreme fishing show channel” these days) and of course, ate lots and lots. 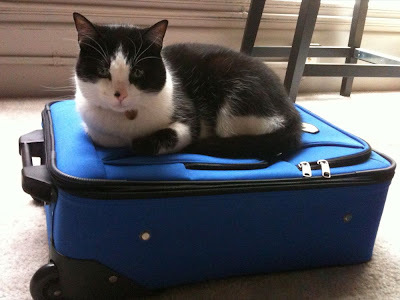 Though kitty didn’t want us to leave, we stocked up on snacks and headed up to Columbus. 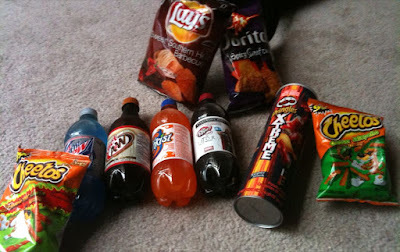 How could I not buy XTREME pringles? After arrival, we walked over to the Elevator brewing company, a brewpub in downtown Columbus. 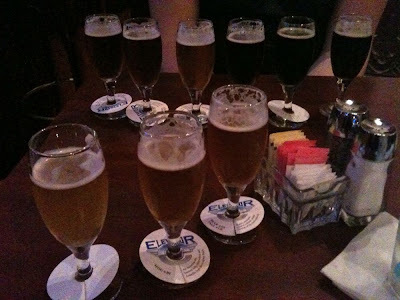 We tried almost all their beers, via the convenient “sampler” package, and ordered dinner. The star of dinner by far was the tasty tuna tartare, which was layered with crispy wontons. It made the presentation very attractive, and also was easy to eat. David really liked the Dark Horse Lager, we both enjoyed the Procrastinator Doppelbock, and I ordered a full pint of the nicely balanced Mogabi pale ale. The next day, we visited the North Market. The North Market is very different than Findlay. It’s definitely targeting more upscale clientele. There’s additional seating on the second floor, which we liked. 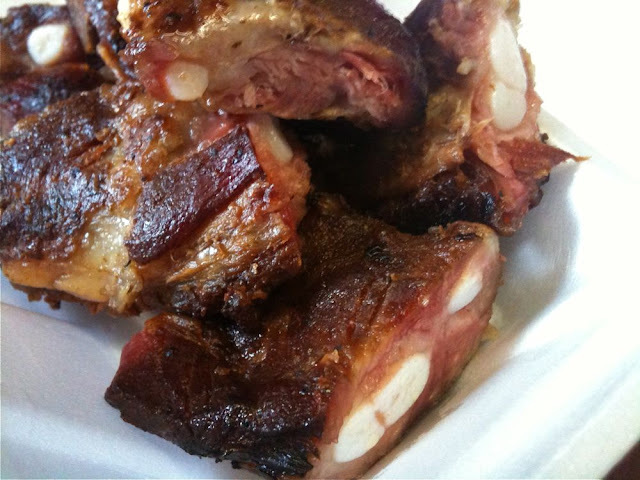 We got some barbecue at Holy Smoke, some pretty chocolates and some wild boar bacon. 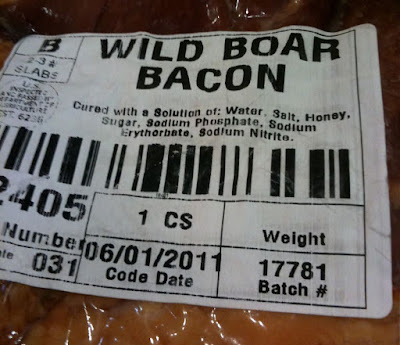 Because when you see wild boar bacon, you don’t pass it up. The barbecue was OK, and obviously smoked over wood, though a little dry. 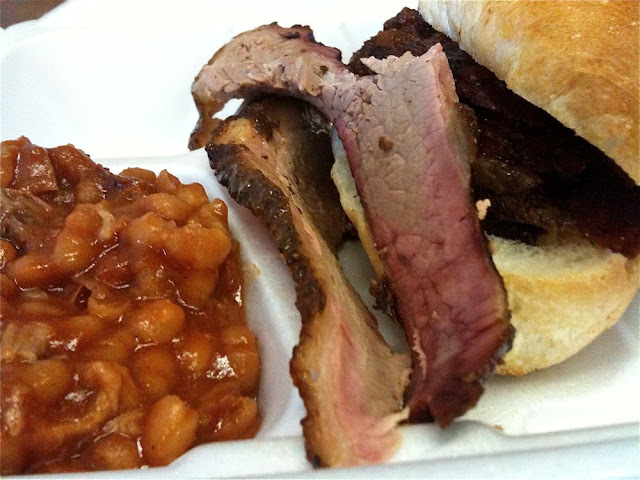 Holy Smoke runs into the holding problem a lot of barbecue places fall victim to. Other than the butcher we bought the bacon from, no one at the market engaged us. Maybe it was because it was a weekday, but the Market had a really weird feel to it. 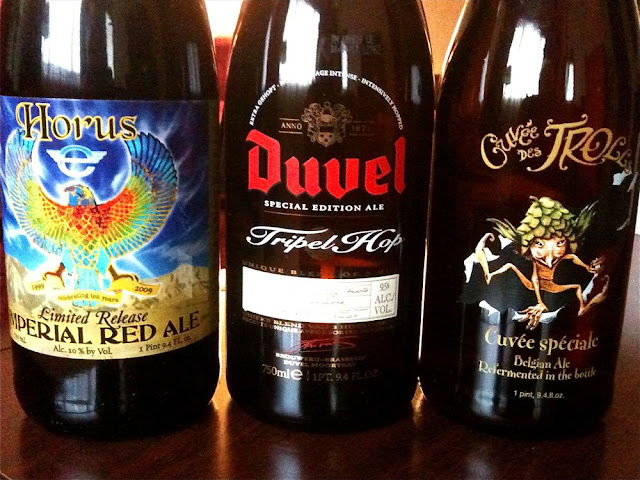 We stopped and picked up some beers at one of the shops before we left. 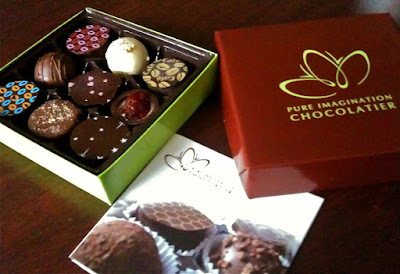 We also walked up to Chocoholique, a boutique shop filled with all sorts of chocolates of every flavor imaginable. And yes, these too. On our way back to the hotel, we stopped at Barley’s brewpub, which had one of the most delicious raspberry wheat beers I have ever had. 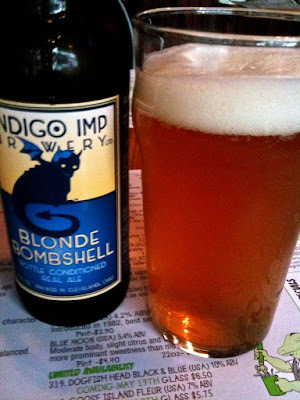 That evening, we went to Bodega, a local restaurant with plenty of beer on tap. We each got a pint and some nachos. Bodega does have a very nice draft list, but it was incredibly loud in the restaurant, so we headed up the street to the Surly Girl Saloon, where I ordered “the defiler”, a deluxe veggie panini with bacon. We checked out on Wednesday and went South to the German Village, to visit the Book Loft, a gigantic independent bookstore. Filled with rooms and rooms of books, the place was so big David actually got lost in the store. I eventually found him and we spent way too much money on books. It's a really cool place, despite the terrible website. Don't be scared. Lunch before we departed for Cleveland was Dirty Frank’s Hot Dog Palace, which I had been looking forward to. It’s a smaller restaurant, and it has a decent beer list and slushies you can add various liquors to. Since it was lunch, we didn’t indulge in the hard stuff, though David did have an “amazing larry” which was cherry slush and red bull. David ordered the “doginator”, a bacon wrapped hot dog, topped with beef brisket, barbecue sauce, cheddar and onion rings. I chose the “puff the magic popper” hot dog with cheddar cream cheese, fresh jalapenos, and plenty of bacon bits. We split the deluxe tater-tachos, which were absolutely awesome. 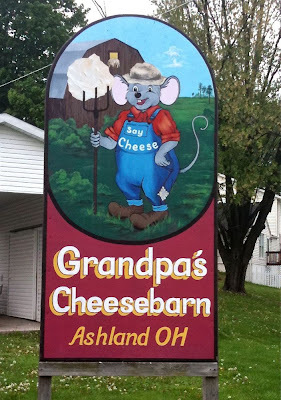 On our way up to Cleveland, we stopped at someplace I’ve been hearing about for months: Grandpa’s Cheese barn. We stocked up on a few cheeses, some jerky, jams and jellies and continued North. Could it be a trap? Worth it to find out. Dinner that evening was at the Winking Lizard, a chain restaurant with a big tap list and even bigger bottle selection. 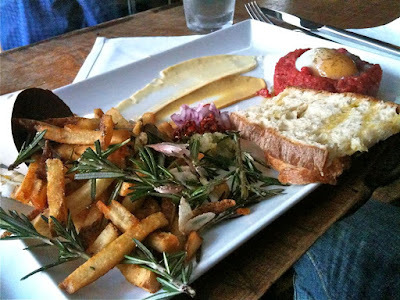 Food was pretty standard bar fare, though David did get a kobe beef burger with Orval cheese and a fried egg. 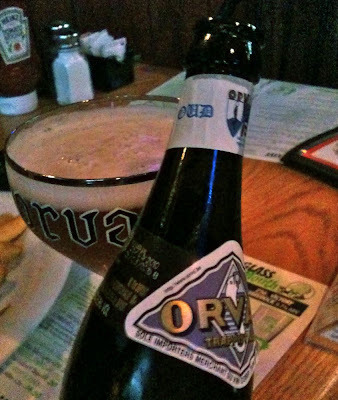 We tried some aged Orval, which was very unique. 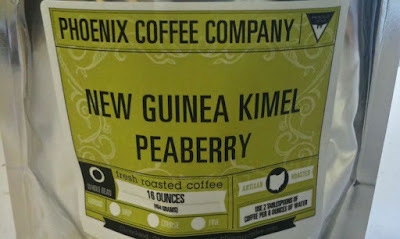 Thursday morning, we headed over to Phoenix Coffee, a local coffee roaster located in downtown Cleveland, for an inside look at the roastery. 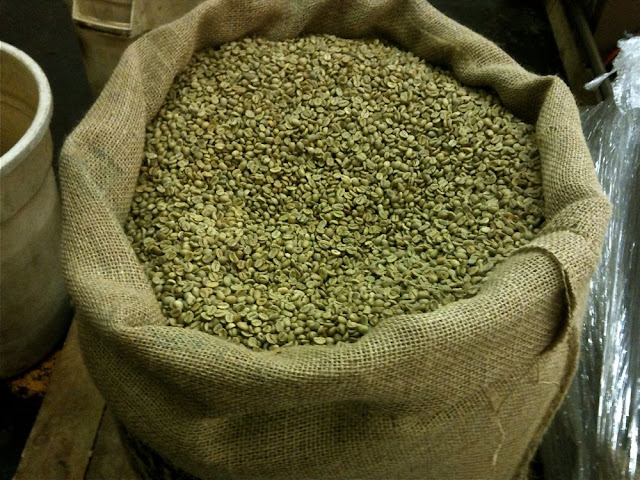 We watched some batches of coffee roast, bought some beans and took a short video. The weather was nice, so we stopped at the zoo for a little while. Cleveland’s zoo has a different feel to it than Cincinnati. It feels more Jurassic Park like. In addition to the zoo animals, we saw about 20 chipmunks throughout the park. They. are. everywhere. Dinner that evening was a debate. We ended up doing a coin flip, and boy were we glad we did. We ended up at the Greenhouse Tavern, which was recently featured in the latest edition of Culture cheese magazine (Yes, there’s a cheese magazine, and of course, I buy it). We were seated in the front in the window, which was nice for people watching. David chose the chef’s tasting menu, allowing him to pick four dinner items. 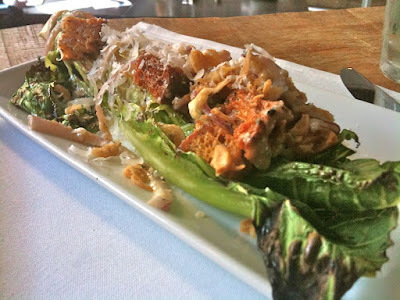 He chose the foie gras steamed clams, beef tartare, Caesar salad and one more thing. Guess which one he picked? 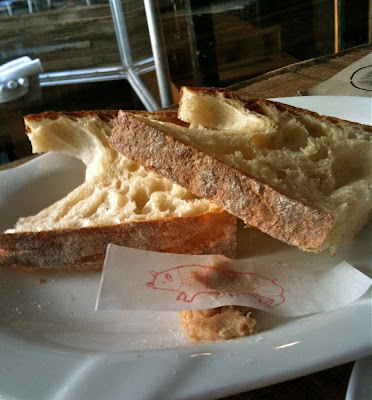 Yes, David ordered the pig head. There are pictures of it in our twitter stream, if you’re curious. It looked pretty much like what you’d expect half a roasted pig head to look like. And it was delicious. The pork was tender and amazing. I recommend it, if you think you could get past the pigs head thing. 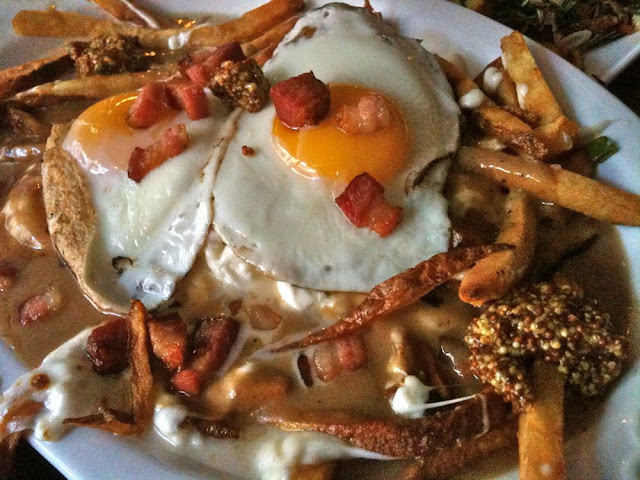 I chose the confit chicken wings with lime and jalapeño, which were also excellent, and the decadent “animal style” frites with cheese curds, bacon, gravy and fried eggs. 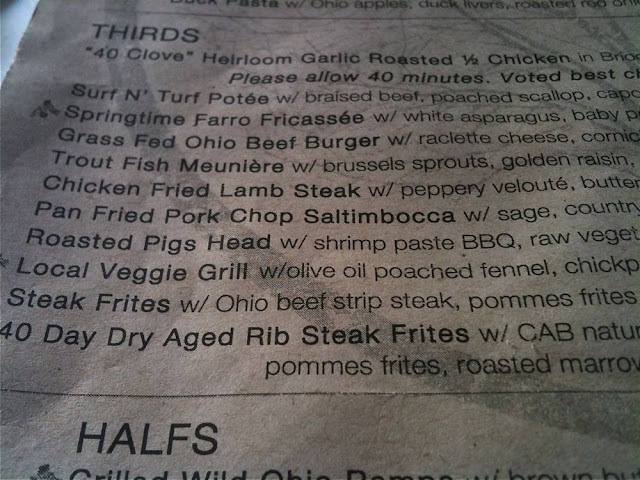 We highly recommend the Greenhouse Tavern if you’re in Cleveland. 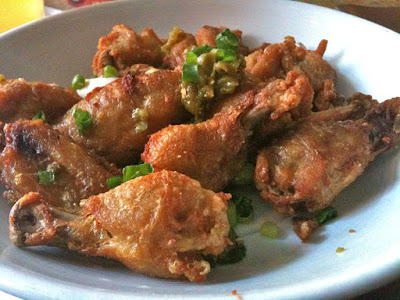 David said it was one of the top meals of his life, and after eating the foie gras clams, he was literally speechless. On Friday, we headed out to Cleveland’s Westside Market. This was definitely one of my favorite stops on vacation. 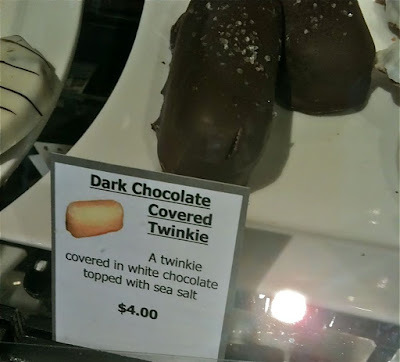 The Westside Market is incredible. Think Findlay Market, turned up to 11. Produce has its own area, a vast row of various vendors, with colorful fruits and vegetables stacked high. It was beautiful. And the Market? Dozens of meat vendors, selling anything you could possibly want. Cannolis, all sorts of breads, pastries, homemade fudge with unique flavors. 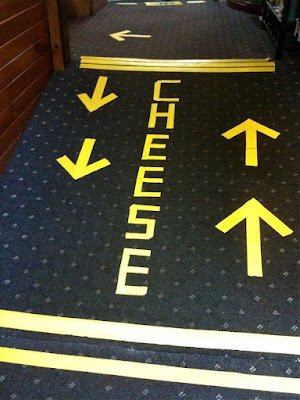 And cheese. Dear god, the cheese. We sampled various cheeses and spoke to the cheesemonger at the counter for over 15 minutes. He had some helpful suggestions of what we should visit and where we should stop by in the market, and was extremely nice. After wrapping up over 3 lbs of various cheeses for us, he even threw some black truffle infused local honey into our bag. Between the cheese and honey, I was absolutely giddy. We stopped by the Great Lakes brewpub next to the Market, and visited Penzey's spices, which is sort of like the Sephora of spice stores. 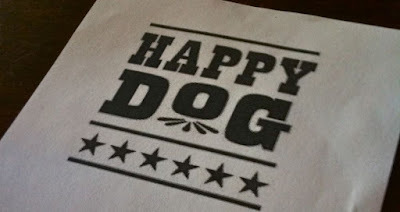 For dinner, we visited a restaurant the cheesemonger recommended—Happy Dog. Yes, another hot dog place. With an insane list of toppings and 20 beers on tap, including an amazing peanut butter cup coffee porter from Willoughby, dinner was great. 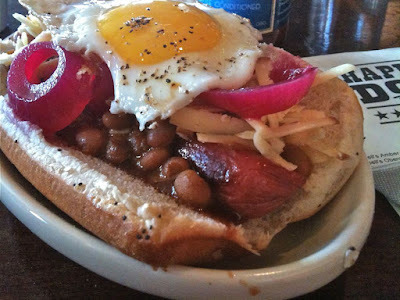 Hot dog with bourbon baked beans, smoked gouda, pickled onions and barbecue sauce...and a fried egg. We checked out Saturday and headed West, to Melt Bar and Grilled, possibly the reason for our entire trip to Cleveland. A grilled cheese restaurant? I am so there. I chose the “big popper” sandwich, with fresh jalapeño, cheddar and herbed cream cheese, served with mixed berry preserves. The sandwich is beer battered, deep fried and topped with powdered sugar. And it was even better than I imagined. 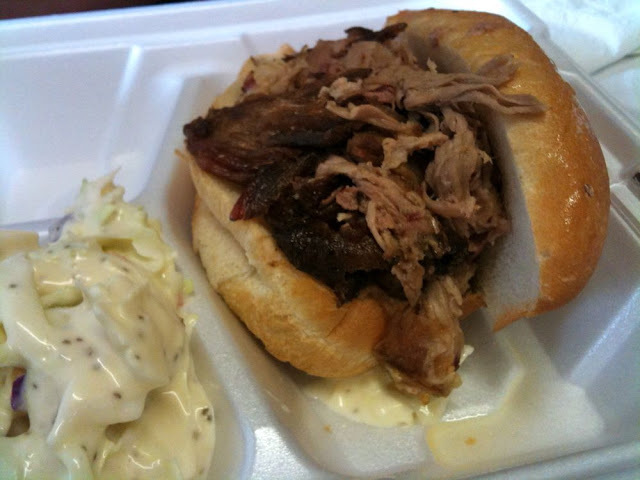 David chose the prime rib sandwich, which had mashed potatoes in the sandwich. Melt is a magical place, and it will get a post all of its own shortly. We stayed downtown in both Columbus and Cleveland, and it was very interesting to see how different urban areas are in comparison to Cincinnati. Columbus and Cleveland are way bigger in size. Cleveland reminded us more of Cincinnati, and the people there were definitely more welcoming. Almost everyone we interacted with had recommendations for where we should visit, and seemed interested in how we had found the city so far. Columbus, not so much. Not to say we didn’t enjoy Columbus too—it has a ton to offer, but if we had our choice of the two, we’d definitely choose Cleveland. Though we did notice Cleveland has cameras everywhere--it's like an entire city of people that never read 1984.